I have seen numerous crime-detective shows that have used psychic detectives in order to find a murder, or missing person, etc. I never really believed in their powers, but also never researched much on psychic detectives, until reading the pseudoscience and paranormal book. In the case of Charles Capel, a Miami University professor who had Alzheimer's disease, wandered away from his home in Oxford, Ohio, and was later found "because of the psychic detective", it was very interesting to read two different sides of the story. I can completely see how people could be mislead into thinking that the psychic was actually responisble for finding Charles' location, however after reading the real facts of the case I no longer believe this to be true. Noreen Renier's, the psychic detective's, descriptions of where Capel was, were very vague, and could have applied to multiple different things. For instance, when predicting his location, she mentioned seeing a stone, a wooded area, a creek, a fence, and a tower with an antenna on top of it, ad also said he was about 8 miles away. For the stone aspect of it, Capel was found near a place called Stoney Creek, and that was interpretted as correct information that was given from the psychic. It all sounds good when you don't actually look into it more. The vagueness of the stone prediction could be consistent with a wide variety of scenarios, for instance if a big stone had been near Capel's body. Also, we tend to remember information the psychic provides and overlook information that was inconsistent. Capels was found near a wooded area, but it was less than a mile away, not 8 miles. Another interesting fact, the police were not even the ones who found Capel's body; they searched for 2 months until a hunter actually found Charles. After numerous studies have been done on psychic detectives' performances, the overall conclusion seems to be the same for each; "psychic" detectives perform no better than regular people when it comes to predicting facts from crime scenes. Also, when a psychic gets a fact right about a crime, they attempt to highlight that correct guess and overlook their other statements that were very wrong. After the study performed by Martin Reiser of the Los Angeles Police Department, he stated, "The research data does not support the contention that psychics can provide significant additional information leading to the solution of major crime." So, after reading the pseudoscience and paranmoral book, my disbelief in psychic detectives has grown, however I can understand why people may believe in them. It is up to you to decided whether or not you believe. 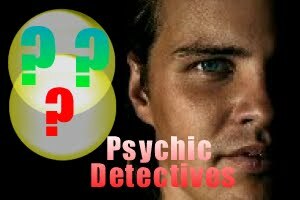 I have watched several detective shows that claim to use the expertise of psychic detectives to solve murder mysteries. I have to say that they make the psychics seem extremely valuable, skilled, and helpful. I will have to watch more closely to see if the facts they give could be guesses.